Experience spring in Ibaraki, when the field at Hitachi Seaside Park turns into a bright shade of blue like that of the sky. Learn more about the nemophila garden and its dreamy sights in this article. You may find yourself thinking that as you enjoy a conversation with your loved ones while strolling up Miharashi Hill in Ibaraki prefecture. 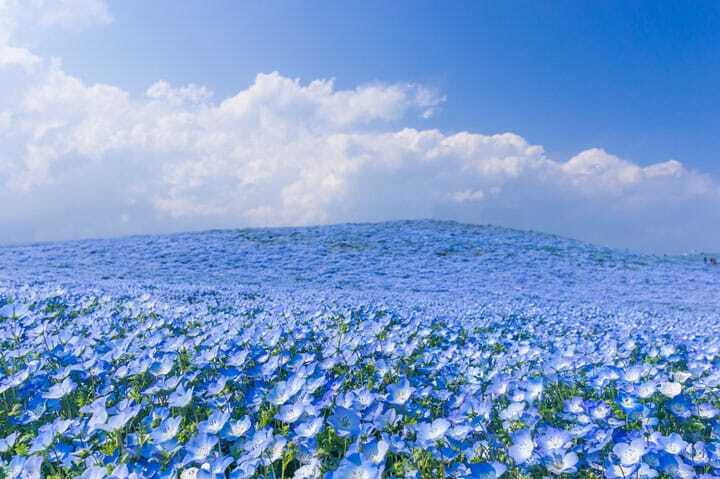 The goal for today is to see the ”Nemophila Harmony” that is said to cover an entire hill from the end of April to mid-May. So, you may be wondering what is so harmonious? Is Hitachi Seaside Park actually as pretty as it looks? You may wonder how much of the photo has been edited for the internet. Those with low expectations are sure to be shocked. After a short ten minute walk after entering the park, you will wander into an area where you will be surrounded by tall trees and beautiful natural scenery. As you continue along the curved path, an open area can be seen ahead of you. You may hear something along those lines from other visitors to the park. As you get closer, you and the others will realize that the faint blue sky you can see peeking through the trees is actually nemophila (baby blue eyes) flowers. When you realize that the sky-like expanse of flowers ahead of you is real, you're sure to feel awestruck. It's almost impossible not to be! It's not the sky! The nemophila flowers are practically bluer than the sky, if you look closely. What an amazing sight! When you take a closer look, you will notice there are some that are white, lighter blue, or even a purple-y blue. Some are round and some have sharper petals. There may be 4.5 million nemophila blossoms here, but each flower has its own charm. Walk up to the top of the hill to get a wonderful view of the Pacific Ocean, and you'll feel like you're completely surrounded by blue. Enjoy the refreshing breeze as you watch the baby blue flowers sway. Why not take a moment to let yourself fully relax and take in the moment? A visit here is one that you won't soon forget. Fixed holidays Every Monday, December 1st, January 1st. Access 70 minute train ride on the limited express Super Hitachi from Ueno Station to Katsuta Station. From Katsuta Station, get on the Ibaraki Kotsu bus from the East exit. From stop number 2, a bus goes to Seaside Park West exit or the South exit. It takes around 17-23 minutes.